ALBUM REVIEW: "All My Yesterdays"
Big band music was the most popular form of jazz in the 1930's and 1940's, but by the 1950's the genre was fading. 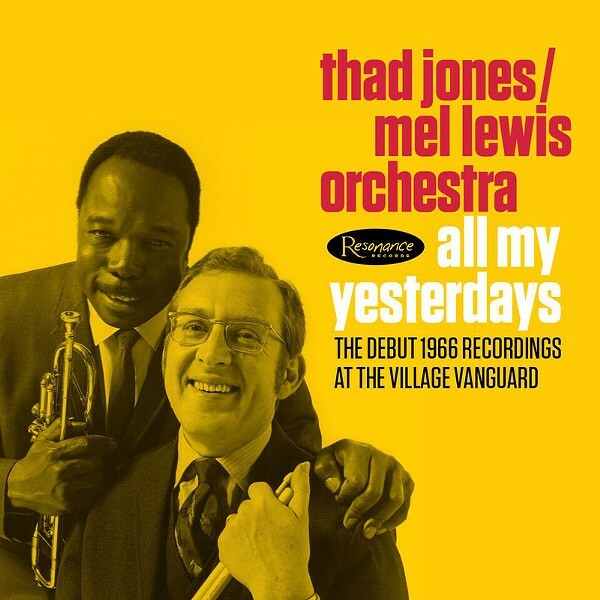 In the 1960's, it took a force of nature to revitalize it: The Thad Jones/Mel Lewis Orchestra. Listening to "All My Yesterdays: The Debut 1966 Recordings at The Village Vanguard" you'll feel like you were present at the beginning. Jones and Lewis had assembled some of the best players in jazz and brought the adventurous spirit of the times to the big band form. These superb recordings, released for the first time, were made by George Klabin, then a 19-year-old student. Now president of Resonance Records, Klabin taped the band to help it land a recording contract. The two-disc set features a 92-page book that includes interviews with all living members of the original group. And what a group it was. Along with Jones' brilliant arrangements, tracks feature solos by Hank Jones (piano); Joe Farrell, Eddie Daniels, and Marv "Doc" Holladay (reeds); Snooky Young and Jimmy Owens (trumpet); Bob Brookmeyer (trombone); Lewis (drums); and many more. You can feel the energy, playfulness, camaraderie and joy on every cut.